Audi plans to offer a low-volume model based on the Quattro concept, pictured. 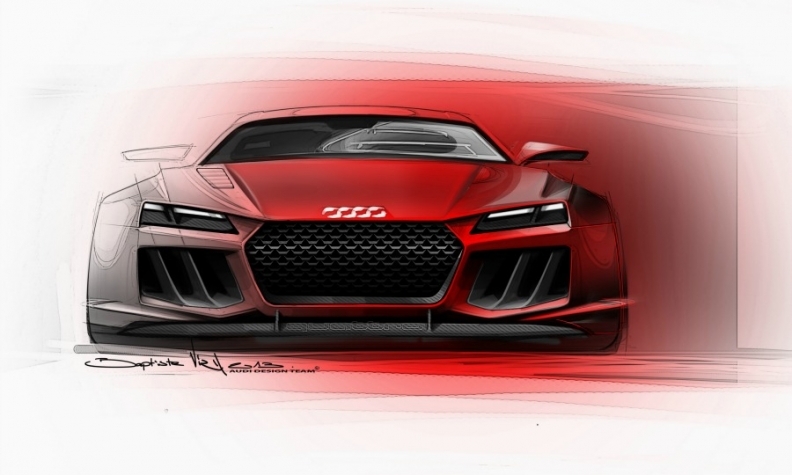 Audi has released design sketches revealing its Quattro plug-in hybrid supercar concept, which it will showcase at the Frankfurt auto show next month. The modern-day Quattro aims to revive the spirit of the rally-bred Sport Quattro launched in 1984. The aggressively styled coupe has been conceived as a limited-production model that is set to be priced above any existing Audi model. The new car will serve as a technological figurehead for the rest of the lineup with a new plug-in hybrid driveline that mates a twin-turbocharged 4.0-liter V-8 gasoline engine and electric motor for an overall output close to 800 hp. The production version will be assembled on a dedicated line at the Quattro division in Neckarsulm, Germany. Sales of the car are expected to begin in 2016. The aggressively styled coupe concept, pictured, marks Audi's return to focusing on all-wheel-drive vehicles. First hinted at in 2010 with the earlier unveiling of an Audi Quattro concept, the new car is expected to form the centerpiece of Audi's renewed focus on all-wheel drive following moves by Jaguar, BMW and Mercedes-Benz to increase the number of four-wheel-drive models in their lineups. Audi officials have already revealed to Automotive News Europe sister publication Autoweek that the focus of the company's activities at the Frankfurt show will be on four-wheel drive. "We have a great history with quattro four-wheel drive, and this will be reflected by what we have in store for the Frankfurt motor show," a source said. Despite issuing official sketches of the new car, details continue to remain scarce, but in a move aimed at reining in development costs and providing crucial economies of scale, Audi is thought to have held firm to its original plans to base the road-going production version of the well-received Quattro concept on a modified version of the MLB platform that underpins the A5. However, while the earlier concept rode on a 2600mm wheelbase, the production car is likely to use a wheelbase similar to that of the existing A5, at 2810mm. The change will alter the Quattro's proportions slightly but, at the same time, provide it with added interior space. The use of the longer wheelbase means the new car is also set to grow beyond the 4280mm of the earlier concept to somewhere around 4500mm in length, or just under 200mm less than the A5. Width and height are, however, likely to mirror the concept at 1860mm and 1330mm, respectively. In place of the 408-hp turbocharged 2.5-liter, five-cylinder engine used in the earlier concept, Audi looks set to provide the production version of the Quattro with a heavily tuned version of its twin-turbocharged 4.0-liter V-8, complete with cylinder deactivation. Audi sources suggest power will rise to more than 600 hp -- 40 hp more than the recently introduced RS6 Avant, which uses the same powerplant. Audi says the addition of a 170-hp electric motor will boost overall output of the new four-wheel-drive flagship to nearly 800 hp. Lithium ion batteries mounted low down in the floor of the trunk will be recharged with a plug, and electric energy will be recuperated on the run via braking. The power will be channeled through a seven-speed dual-clutch gearbox with paddle shifters and, in keeping with tradition, a Torsen torque-sensing four-wheel-drive system with a sport differential offering torque vectoring to all four wheels. Extensive use of lightweight materials will be made in non-load-bearing areas as part of Audi's Ultra weight-saving initiative, but whether Audi can achieve the 1300kg curb weight it claimed for the concept remains to be seen. As a point of reference, the all-wheel-drive, 328-hp supercharged 3.0-liter V-6-powered S5 weighs 1745kg. Sources suggest a 0-100kph time of less than 4 seconds and a top speed approaching 300 kph, which is the sort of straight-line performance matched in the Audi lineup only by the R8 V-10.